For years, Chrissy Teigen’s Twitter has been a constant source of joy for fans. She’s chronicled everything in her life, from marriage to pregnancy to publishing her cookbook and beyond, with the wit and impatience that became her signature. 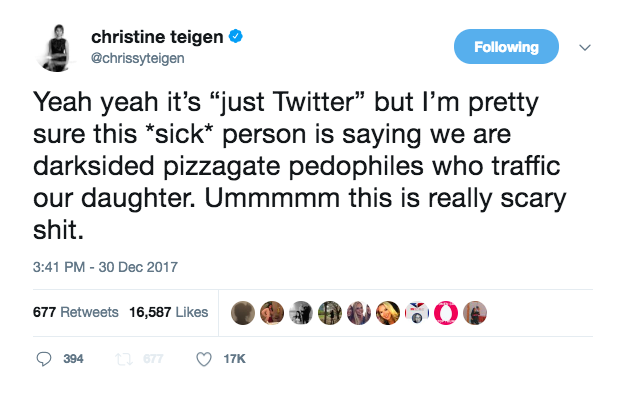 Unfortunately, Chrissy Teigen’s Twitter is now private. The reason behind it will surprise you, because it’s pretty dark. There’s a dark section of the web that’s heavily into Pizzagate, a ludicrous conspiracy theory that suggests high-profile celebrities and government officials are involved in human trafficking. It’s the worst. It is the worst. And now, they’re targeting Chrissy Teigen’s Twitter, formerly a shining beacon of hope and hilarity. The inundation was kick-started by Teigen’s infamous LAX to LAX flight. A passenger with an incorrect ticket caused an international flight from Los Angeles to Tokyo to be turned around, and Teigen happened to be on board. As per usual, she tracked what she was doing via Twitter. This activated a truly unhinged group of conspiracy theorists, all of whom were freakishly organized, and determined to prove that Teigen and Legend were part of some bananas cult with the U.S. Government. She and husband John Legend managed to publicly shame Twitter into stripping one account’s verification. An account with nearly 50,000 Twitter followers helped lead a charge onto Teigen’s Twitter account, encouraging people to look for clues and signs and hints that Teigen and Legend were bad people and their toddler-aged daughter was in trouble. 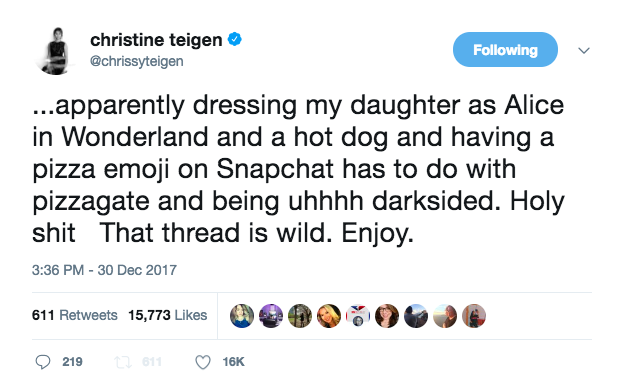 It’s twisted and bizarre; people desperate for “evidence” found it in things like the daughter’s Halloween costumes and Teigen’s use of emoji. The Twitter abuse was so strong, and so hurtful, she ended up locking her account. That way, folks can say whatever they want to her and about her; she’ll never see it. 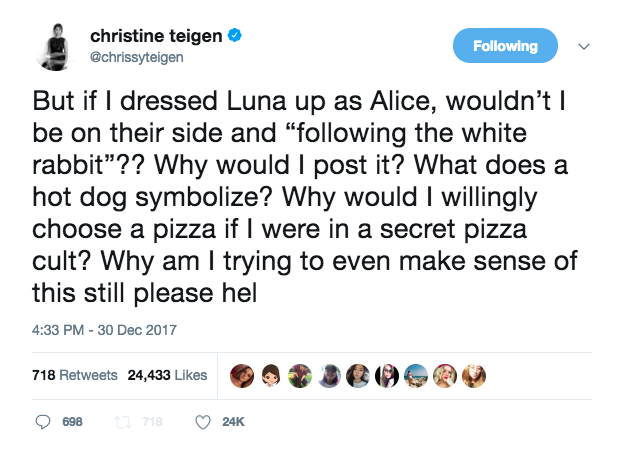 The downside is, if you weren’t already following Chrissy Teigen’s Twitter, you might not be able to for a while. That means no more RTs. Hopefully, she’ll unlock it soon – 2018 needs her!